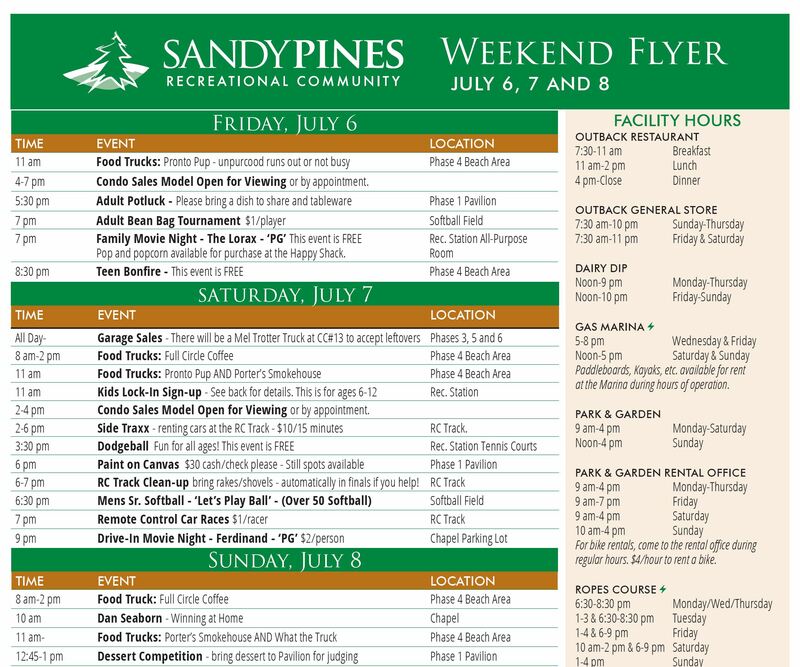 The Sandy Pines Weekend Flyer starts each season on Memorial Day Weekend and ends on Labor Day Weekend. It's the weekly guide to all events and important park information. It's published every Thursday and posted on our website on the Activities Page and the Members Page. Once posted online, it's sent to members through our Weekly Member E-News, shared on Facebook and printed for distribution throughout the park. It's also posted on our park cable channel 9.2 for easy access and endless entertainment 24 hours/day! Sponsorship opportunities are available. Please contact Kathy Brott at kathy@sandypines.com or at 616-896-8316.